Since 2007 we’ve asked leaders and team members to identify the top issues facing their organizations — and particularly the “people side” of the equation. The survey explores top issues as well as employee attitudes and the role of emotional intelligence in solving those key issues. 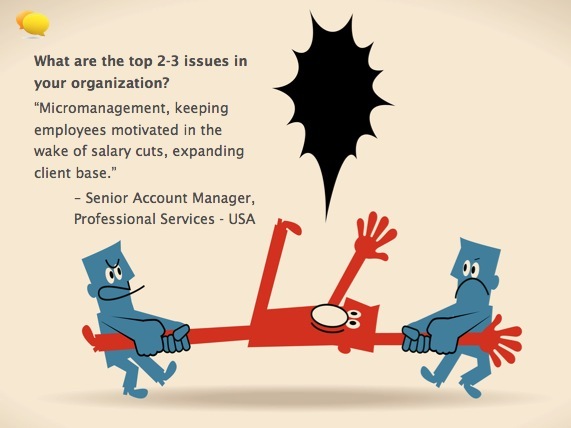 We start by asking an open question, “In simple terms, what are the top 2-3 issues in your organization?” — the report is peppered with intriguing answers. The one to the right is fairly thematic both in the manager’s comment, and the graphic representing a sense of irreconcilable internal conflicts. The full report is available for free using the download form below. 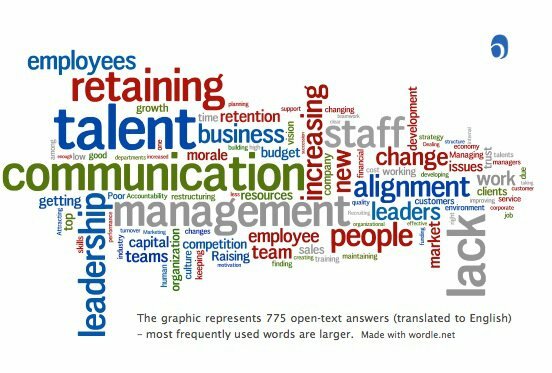 These finding represent 775 responses from leaders and employees worldwide. They come from all levels (mostly management, 26% senior execs) and all sectors (mostly business & industry) and all global regions (mostly North America). Find it. Keep it. Feed it. Lead it. The top issues globally, across sectors, tie to retaining good people and the leadership capability to align individual and organizational priorities. Respondents recognize that people are burned out after years of “more with less” — while few organizations are taking serious and systematic efforts to create a place where good people actually want to work. Vision is absent. People are not aligned. Where are we going – and why? As in our previous surveys, leadership remains a top concern. 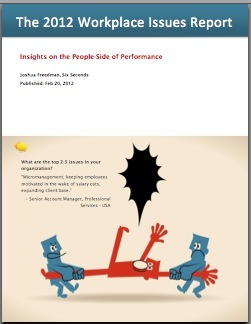 On a selection of “people issues,” 58% of respondents identified leadership as the top concern. What do they want from leaders? The top “wish” is free, and an absolute basic: Communicate the vision. But, in times of stress, most leaders have their heads down to focus on the small stuff. Few leaders are standing up and standing out. The results are dangerous. 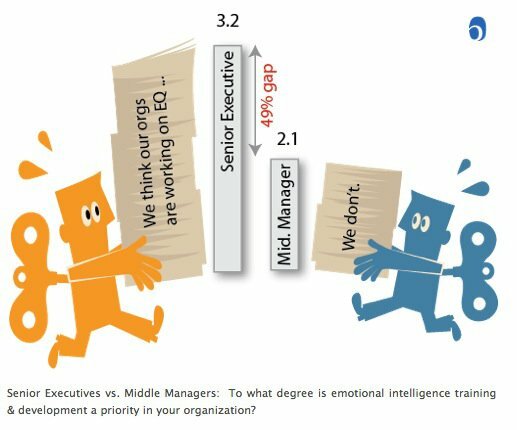 Senior managers perceive their organizations are using EQ – others, not so much. Organizations making EQ a priority score 32%-39% higher on the questions above. To learn more about these findings, fill in the form below and the report will be immediately send to you via email.